Wisdom teeth are molars that grow in much later than the rest of your adult teeth. Unfortunately, they often cause complications and must be removed. 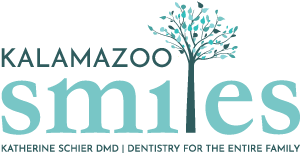 At Kalamazoo Smiles, our Kalamazoo dentist can tell you if your wisdom teeth need to be extracted. Overcrowding: When wisdom teeth grow in, they can cause your other teeth to shift. This could result in overcrowding or a change in the alignment of your bite. Impacting: Sometimes a wisdom tooth cannot fully grow in because it is blocked, or impacted, by another tooth. This can cause pain, infection, and other serious oral issues. Tooth decay: If a wisdom tooth does not come in properly, it becomes easy for bacteria to get trapped. Our wisdom teeth dentist can let you know whether your wisdom teeth are likely to cause any issues for you down the line. You can then choose how you would like to proceed. Depending on which form of sedation our dentist suggests, you may need to be driven home after your wisdom tooth removal. For the first 24 hours after your oral surgery, you’ll want to eat soft foods and avoid brushing the area. Throughout the recovery process, avoid using straws or smoking cigarettes, as these will prevent the sutures from healing properly. Wisdom teeth removal recovery time varies from patient to patient, but you will likely experience some swelling and discomfort in the first few days. Our oral surgery dentist will talk to you about your pain management options. If you encounter any symptoms such as fever or severe bleeding, call our office right away. For wisdom teeth removal in Kalamazoo, MI, count on the oral surgery dentist at Kalamazoo Smiles! Our team has experience with dental extractions and we’ll be happy to walk you through the wisdom teeth removal process. Set up an appointment by giving our office a call at (269) 353-3700 today.